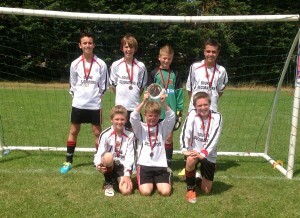 After a tense 2-1 win against Droitwich Cougars in the semi final, the Tigers played Cleeve Colts in the final. After a long throw from Mitchel Wright, Will Leach headed in the first goal, the game was nearly over when Cleeve Colts scored a goal from long range. The Tigers were still on top during the short period of extra time, then the whistle goes….. Managers and Players heart rate go into overdrive as the realisation of penalty’s shoot out beckons. The first three pens for each side are scored the then Cleeve miss 2 and Tigers have one saved, under pressure George Townson runs up and scores in the bottom right… Winners.